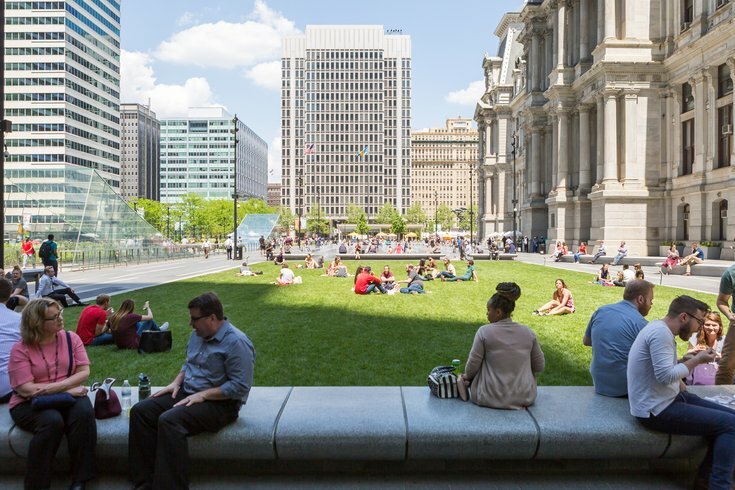 People enjoy Dilworth Park on a sunny spring day. Center City Fit, the free fitness program aimed at getting Philadelphia moving, returns to Dilworth Park Monday, April 15. Trainers from Optimal Sport Health Club at 1315 Walnut, will be offering class throughout the program, which ends October 15. Zumba classes will be the schedule on Mondays from 6 p.m. to 7 p.m. and Boot Camp classes every Tuesday from April 16 to July 23 from 6 p.m. until 7 p.m. The Tuesday schedule switches up July 30 until October 15 when cardio kickboxing class begin from 6 p.m. until 7 p.m.
A Zumba Dance for Peace is scheduled for Saturday, June 1 from 2 p.m. to 4 p.m. The program is sponsored by the Rothman Orthopaedics and the Center City District Parks.